We know our organs are supported by blood. We know that that blood is delivered to our various cells through a network of blood vessels. What we don’t know is how to create a fine three-dimensional network of vessels in the lab for bioengineered tissue. 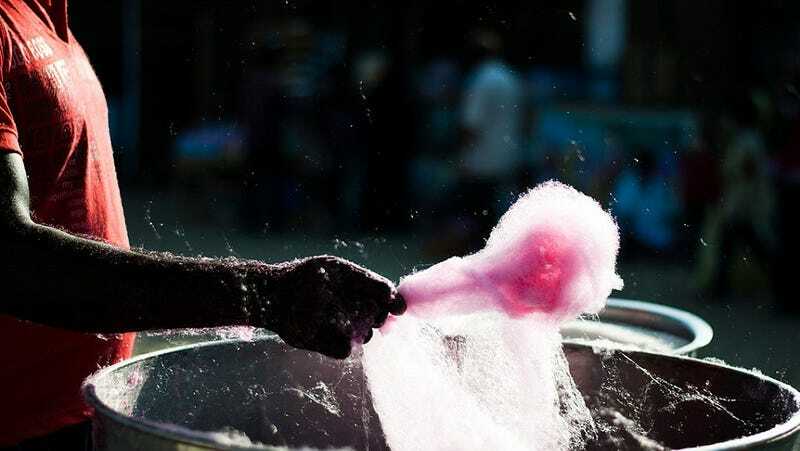 Researchers at Vanderbilt University found a clue in an unlikely source: cotton candy. They just published their results in Advanced Healthcare Materials. Any tissue cut off from this support network would die. This fact frustrated any lab trying to grow bioengineered tissue. To make tissues of the thickness needed for organs, labs would have to create an incredibly complex network of fine channels—something with almost a cotton candy consistency. This comparison to cotton candy inspired lead author Leon Bellan to go out and buy a cotton candy machine from Target, using it to spin out his own threads. He found they were about the same size as capillaries—under the size of a human hair—making this a promising method for building those all-important channel structures. Score one for sugar. Sadly, sugar isn’t the answer to all of life’s problems. It does create a network of channels that could support cells, but it dissolves too easily. So the researchers set aside the cotton candy machine and designed something more specialized. They came up with a machine that worked in a similar way to cotton candy machines, except that instead of spinning out sugar, it spins out a polymer called Poly(N-isopropylacrylamide), or PNIPAM. PNIPAM gets spun into a cloud of fibers, and a solution of human cells in hydrogel gets poured over it. Eventually the gelatin hardens. All of this happens at 98.6 degrees fahrenheit. Although that’s ideal body temperature, the heat isn’t just for the benefit of the cells—it’s for the benefit of the PNIPAM. The polymer is insoluble in water when warm, but when it drops below 89 degrees, suddenly it dissolves away. When it dissolves, it leaves behind a dense, extensive network of channels in the big blob of cells, through which oxygen and nutrient containing liquid can be pumped. This could make for tissues as thick as anyone ever needs them to be.